Pakistan elections 2018 Live Updates: Voting to fill 272 chairs in Pakistan's National Assembly is underway amidst tight security. As many as 105 million (over 10 crore) people are likely to exercise their franchise today. Pakistan elections 2018 Live Updates: Voting to fill 272 chairs in Pakistan’s National Assembly is underway amidst tight security. The Election Commission of Pakistan (ECP) said that all measures are in place to ensure smooth conduct of the democratic exercise across the country. A total of 85,000 polling booths have been set up and over 7 lakh security officials including 3.70 lakh army officials have been stationed to oversee the entire election process. As many as 105 million (over 10 crore) people are likely to exercise their franchise today. 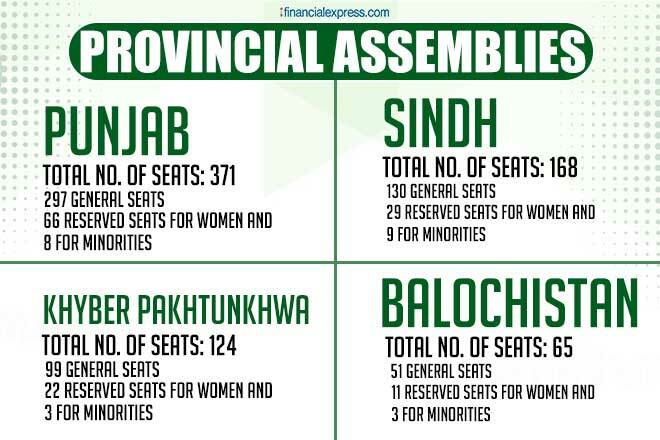 All voters are eligible to caste their vote for two seats in each Assembly – one for the National Assembly and one for their Provincial Assembly. Pakistan has four provinces – Sindh, Punjab, Balochistan and Khyber Pakhtunkhwa. The parties that are in a close contest are Pakistan Tehreek-E-Insaaf of Imran Khan and Pakistan Muslim League (Nawaz) of Shahbaz Sharif, former CM of Punjab and brother of jailed leader Nawaz Sharif. Pakistan Peoples Party of former president Asif Ali Zardari is also in the fray. The opinion polls have predicted a thin margin for PTI than other parties. The PTI is facing a direct fight from PML(N). Also, terrorist and Mumbai terror attacks mastermind Hafiz Saeed is making a debut in the political landscape of Pakistan. He has fielded at least 80 candidates for National Assembly seats under the banner of Allahu Akbar Tahreek (AAT). The voting process will end at 6pm and the counting of votes will start thereafter. 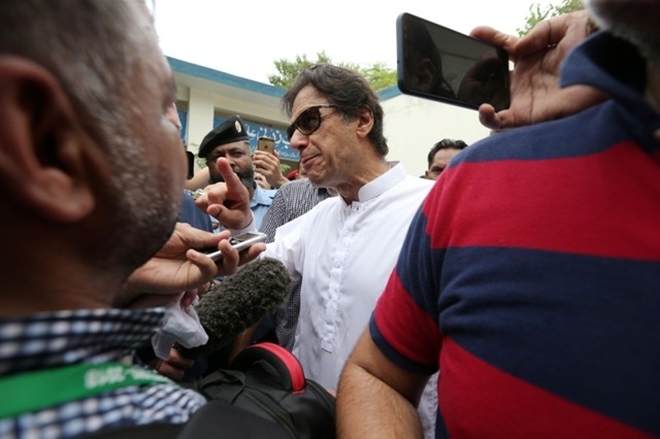 The Election Commission took notice of PTI chief Imran Khan and PML-N president Shehbaz Sharif making speeches after casting their votes in the elections today, which it termed as "violation of the code of conduct". Spokesperson Nadeem Qasim said that actions may be taken against politicians who delivered speeches and those who voted on-camera with their every move being monitored. For the first time in Pakistan's political history, the Election Commission in Pakistan gave the duty of "observers" during polling to members of the transgender community, however, on Wednesday in Lahore they were not allowed to vote. "There are reports that voters from the transgender community in Lahore are not being allowed to cast their ballot in male polling stations," Dawn reported. At least 31 people have been killed including 28 in a suicide blast outside a polling station in Quetta city and 36 others injured as several incidents of violence were reported as the country went to polls. The deceased persons include 28 victims of a suicide blast in Balochistan's capital city of Quetta. Five police officials were also killed in the blast. In Punjab, the stronghold of PML-N, the party is expected to lose ground to Imran Khan's PTI. Many PML-N candidates switched loyalties before the polls, either joining the PTI or running as independents. In Sindh, the PPP is expected to hold on to its rural base. According to a nationwide survey, PTI is leading with 29 per cent, followed by PML-N at 25 per cent and PPP at 20 per cent. A worker of Imran Khan's PTI is shot dead after ANP and PTI workers clash in Swabi's PK-47 constituency. At least two others were wounded in the clash. “I have just voted, the environment is beautiful here, no problem has come in the way.. we want that every person should caste his vote in the right manner,” Saeed said after cating his vote at a Lahore polling booth. (Maine abhi vote cast kiya hai.. mahaul bada khoobsoorat dekha hai mashallah… koi pareshani… koi rukawat nahi aayi… hum chahenge sablog apne vote ka sahi istemal kare…). In a video message, Malala Yousafzai has urged people of Pakistan especially women to go out of their homes anfd participate in the democratic process. The Election Commission of Pakistan (ECP) is optimistic about a record turnout of voters today. ECP Secretary Babar Yaqoob Fateh Muhammad that the ECP is expecting to "see a record turnout of voters due to the increased level of awareness about importance of vote". Polling stations will remain open for voting till 6 pm. MQM-P leader Farooq Sattar exercises his franchise at a polling booth in Karachi. Speaking to rporters, Sattar asked people to vote for his party so that he can push for a new 'southern Sindh province'. "The public has never disappointed us in any election ... we will not disappoint them either. These next five years will be the most important of MQM Pakistan's history." In the 11th general election, the country will see terrorist and 26/11 Mumbai terror attacks mastermind Hafeez Saeed making a debut in the political landscape of Pakistan. Saeed has fielded as many as 80 candidates under the banner of Allahu Akbar Tahreek (AAT) for National Assembly. He has also fielded candidates for provincial assemblies. The ECP had earlier refused to recognise Hafiz Saeed's outfit Milli Muslim League as a political party, failing which he decided to enter the fray under the banner of AAT. According to the ECP, 5,878 polling stations have been declared "highly sensitive" -- official euphemism to mean they are prone to violence -- in Sindh; 5,487 in Punjab and Islamabad; 3,874 in Khyber Pakhtunkhwa and FATA and 1,768 in Balochistan, news agency IANS reported. 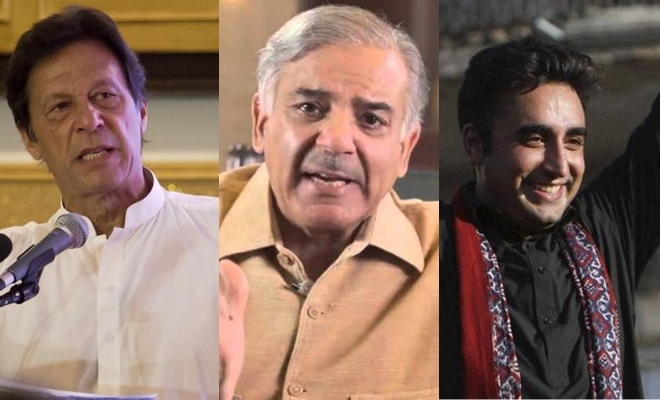 The battle is set to come down to three parties: Shahbaz Sharif's Pakistan Muslim League-Nawaz (PML-N), Bilawal Bhutto-Zardari's Pakistan Peoples Party (PPP) and Imran Khan's Pakistan Tehreek-i-Insaf (PTI). Pakistan has four provinces — Sindh, Balochistan, Punjab and Khyber Pakhtunkhwa. 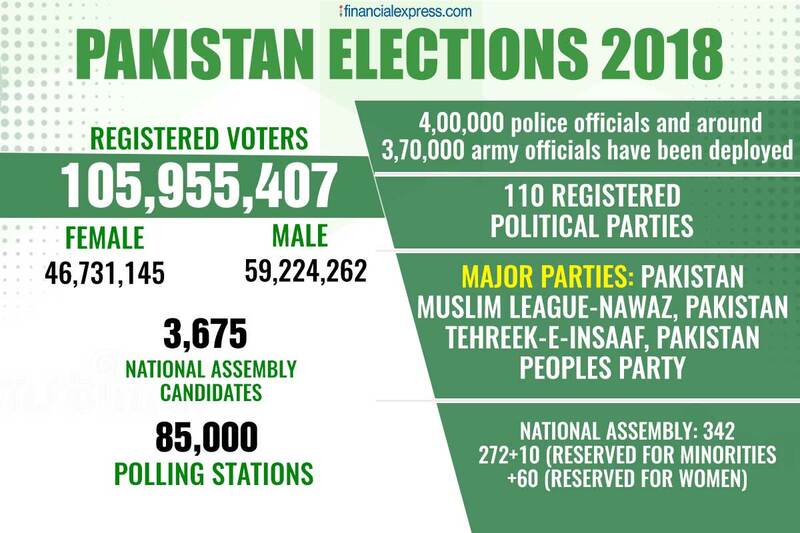 Around 105 million (over 10 crore) voters are eligible exercise their franchise for two seats in each constituency in all the four provinces: one for the National Assembly (272 seats) and one for their Provincial Assembly. The National Assembly has 342 chairs but voters will today vote to fill the 272 seats. additional 10 seats are reserved for minorities and 60 for women. These seats are filed based on proportional representation of the 272 seats. In the previous elections, PML-N of Nawaz Sharif had emerged as the largest party with 166 seats out of a total of 342 in the National Assembly. Although the seats were short of a majority, Nawaz Sharif was able to form a government after several independents joined his party. 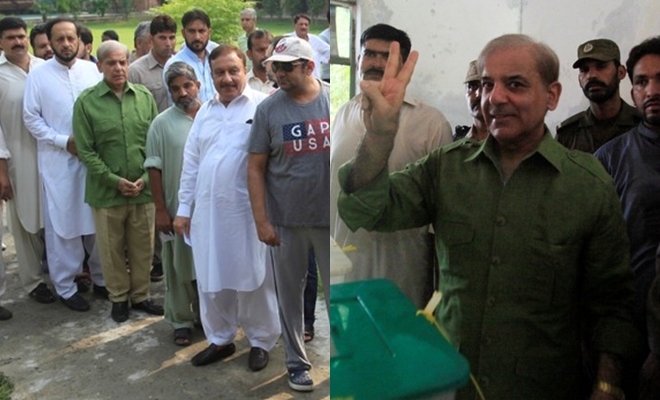 PML-N president and and former Punjab CM exercised his franchise at a polling station in Model Town. He appealed to the people to come out and cast their votes. "Do not waste your time. Get out of your homes and cast your vote. We will change the destiny of this country through the power of people," he told reporters outside the polling station. Sharif promised that if PML-N retains the power, the new government will end poverty and ensure education to everyone. he also said that work on Bhasha dam will begin as soon as the PML-N form the government. "China and Saudi Arabia are keen to help us," he said. Voting is underway across the country amid toght security to elect a new government. The first vote was cast in Khyber Pakhtunkhwa's Charsadda. While polling stations officially opened for voting at 8 am, citizens queued up outside their respective stations as early as 7 am. The Election Commission of Pakistann has declared a holiday in the country to allow citizens to vote in record numbers.